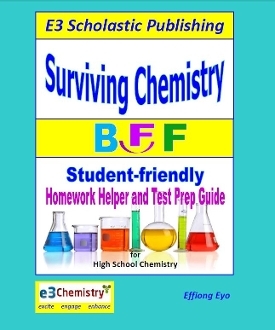 This super simple, super brief, super easy-to-learn and easy-to-understand student-friendly Chemistry Homework Helper and Test Prep book is written to end your struggle and frustration in chemistry. If you are a student that hates having to read 5 to 10 pages in your textbook or review book just to figure out answers to a few homework problems, or a student who studies all night and still don’t feel confident and ready for that next quiz or test, this book is for you. When you need help getting your homework done quick and correct, or looking for a way to study and learn a lot of info in just minutes for that next quiz, test or exam, this book is all that you'll need. Comprehensive: You can find help on just about any general or honors level high school chemistry concept. Written to follow the very comprehensive New York State Regents Chemistry curriculum, students in any state or country can find help on hundreds of concepts over 13 general topics of high school chemistry. Bold and Colorful: Each concept is clearly numbered, bolded and in color so it is super easy and super quick to find. When you are looking to learn about "positive ions,” you’ll find it very quickly without wasting your precious time. Brief, Organized and Bulleted Outlines: You will be able to find, study or learn just what your need to know, fast. When you have homework and tests on multiple subjects, you may not have the time to read pages upon pages of excess information. In this book you get to study and learn just what you need to know about any concept. For those of you who prefer (or like) to read more in order to understand, our Review Book or Guided Study Book may be right for you. Straight-forward: Hundreds of example problems with clean, clear, straight-forward solutions are given in this book. We are certain that you, the student, will find one or more example problem similar to questions you’ll be faced with, and be able to easily follow our solutions to help you quickly and correctly solve these problems on your homework and tests. Highly Visual: You’ll find hundreds of colorful diagrams, pictures and tables that are certain to enhance your learning and understanding of many hard chemistry concepts. Guaranteed to be Read and Used: Unlike many other resource books that are purchased, read once or twice, be bored with, then resold as “used” on amazon, we believe that this book is so easy, so exciting and enticing to encourage you to use it frequently to help get you through chemistry with a much better grade than you might have expected.
. 13 topics of high school chemistry.
. Up to 50 end-of-topic practice questions. Over 500 practice questions to test your understanding.
. Answers given to all questions.
. Additional Materials (not covered in NYS chemistry curriculum) to challenge Honors level students in some topics. Get it in eBook. In addition to the 500 end-of-topic Regents practice questions, you'll ALSO get two very current actual Regents exams in the eBook edition, which makes this book your all-in-one the best chemistry Regents prep book you can get. These practice Regents exams are not included in the hard copy edition because the additional pages would significantly increase the price of this book.